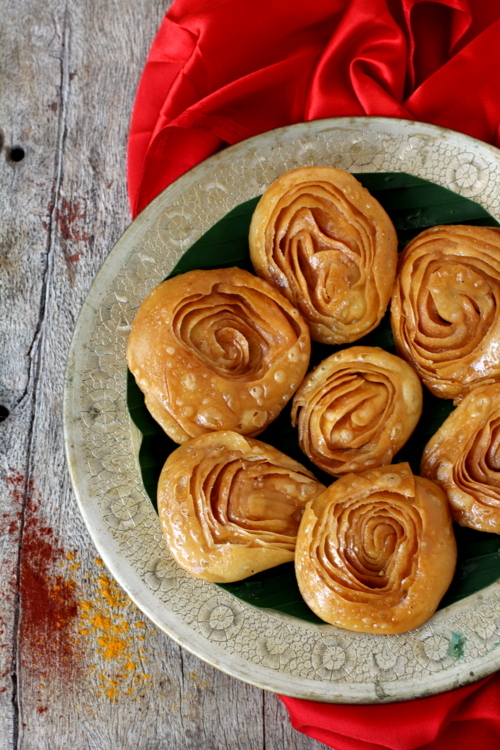 Chiroti is a traditional Karnataka sweet that is prepared on special occasions and religious festivals. It is also a very popular dessert in traditional Maharastra cuisine and is called Chirote. 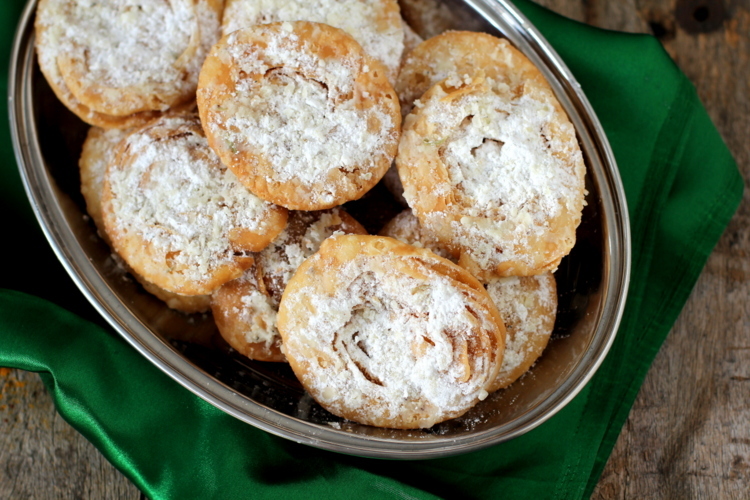 Prepared with plain flour, Chiroti is a fried flaky pastry with concentric circles of delicate layers that is either sprinked with a generous amount of cardamom flavored powdered sugar or dipped in cardamom flavored sugar syrup. Another version of Chiroti, more popularly known as Pathir Pheni, is prepared with “chiroti rava” (a mixture of plain flour and fine semolina/sooji) where the fried flaky pastry is sprinkled with powdered sugar and dunked in badami haalu (almond milk) which is nothing but sweetened milk that is flavored with ground almonds, saffron and cardamom. A mouth watering delicacy that is an integral part every Kannadiga wedding meal and one that I have been fortunate to taste at friend’s wedding in Mysore. In a bowl, add the flour, salt and melted ghee and mix well. Slowly add enough water to make a smooth yet firm dough like puri dough. Cover the dough and keep aside for an hour. While the dough is resting prepare the powdered sugar mixture. In a bowl, add the powdered sugar and cardamom powder and mix well. Keep aside. If using sugar syrup to dip the fried chiroti, prepare the syrup. Heat water and granulated sugar in a vessel till sugar is melted and then continue to simmer till the mixture thickens to single thread consistency on low flame. Add cardamom powder and mix. Turn off flame. Keep aside. In a small bowl, mix rice flour with melted ghee and keep aside. This paste is used to bind the layers of rotis. Pinch off dough such that you have 6 large lemon sized balls. Roll each into thin rotis. 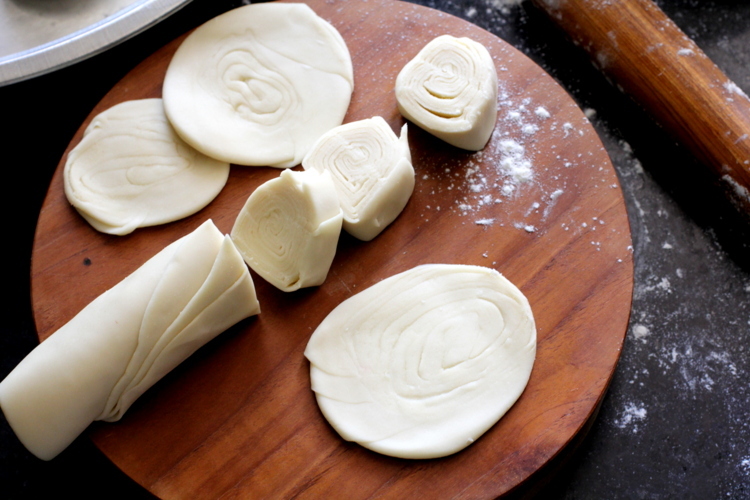 Place a roti on your work surface, smear a tsp of the prepared rice flour paste all over the roti. Place another rolled out roti over it and again smear with a tsp of rice flour paste. Again repeat the process by placing another roti over the second roti and smear with rice flour paste. Now gently roll the pilled up rotis into a log and cut into 1/2" thick circles. Make another log following the same process using the remaining three rotis. With the help of the rolling pin roll out each of the thick circles into thin rotis of 4" to 5" in diameter. Heat oil for deep frying in a heavy bottomed vessel. 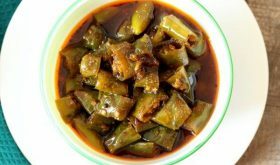 Once hot, reduce flame to low medium and place 3 or 4 rolled out chirotis into the hot oil. Deep fry the chirotis on a medium flame, flipping them gently to cook all over. Once they turn to a golden shade, remove onto an absorbant paper. Immediately sprinkle a heaped tbsp of the powdered sugar over each of the hot chirotis so that the sugar adheres to them while it is hot. Deep fry the rest of the rolled out chirotis and sprinkle with powdered sugar OR dip them in the prepared sugar syrup. Store in an airtight container and they stay fresh for at least one week to ten days. At the time of serving, pour sweetened almond milk over the the chirotis that have been sprinkled with powdered sugar. Eat immediately for a crunchy textured chiroti or allow the chiroti to sit for 10 to 15 mts in the sweetened almond milk for them to absorb the flavors of the milk and turn soft. 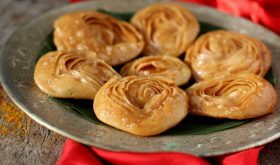 This delicacy is called Pathir Pheni and the chiroti is rolled out from dough that is prepared with equal parts of flour and semolina. The authentic recipe calls for deep frying in ghee. I have deep fried in oil. Ensure that the dough is tight and not soft like chapati dough. By Sailu Published: October 30, 2013 Chiroti recipe - one the best Indian sweets recipes made for weddings & festivals. A fried flaky pastry topped with powdered sugar or dipped in sugar syrup. What basic flour is used here? Maida or Wheat? Hey sailu ,this is also traditional dish in east n west godavari…”Phanilu” ani antaru.My mom makes very frequently. Hi, your recipes can inspire anyone to cook. Can you post recipes using fillo dough/pastry sheets. Hi, I ate something like this years ago but it had some sort of cream in it…..any Ideas on what it might be????? I meant cornets idk why I wrote scones!! which oil did u use for deep frying? Hi Sailu, thanks for the recipe. I attempted this, but my chiroti came out bulky (layers did not separate) and did not fry properly. Can you help me?